Tectonic movements in eastern side of the Americas region are relatively simple compared to the western side. Mid Atlantic Ridge in the Atlantic Ocean spreads North American plate and South American plate away from western Eurasian plate and African plate. In fact, the spreading rate in the southeast Pacific is increasing (http://americastectonics.weebly.com/north-american-plate.html, http://www.tectonics.caltech.edu/images/maps/seafloor_age.pdf, Somoza, 1998). Since there are no microplates in the Mid Atlantic Ridge, it appears the west side of Americas region will continue to diverge away from the Eurasian plate and African Plate. Spreading rate in the Gulf of California (Baja California in Mexico and North American plate separates) has been increasing by approximately 15% for the past 3.58 million years (DeMets and Doxon). Other researches have also shown increase in slip rate between Pacific plate and North American plate. Slip rate between Pacific plate and North American plate was 3mm/year between 19.90 to 10.59 million years and 6mm/year between 10.59 to 5.5 million years. Currently the slip rate is 12mm/year (Dokka and Travis, 1990). Another research shows the plate slip rate at San Andreas dextral fault (http://americastectonics.weebly.com/north-american-plate.html) is 6cm/year for at least the past 4 million years (Atwater, 1970). Many microplates and their relative motions with respect to one another makes it difficult to predict future tectonics in the future. This map of southern California shows present day fault slip rate in mm/year (Dokka and Travis, 1990). 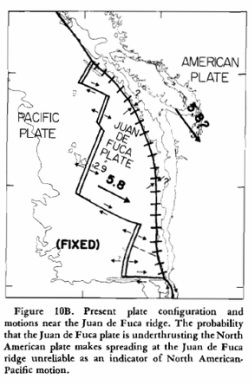 Juan de Fuca plate, a descendent of the Farallon plate, has changed its spreading direction between 4 to 7 million ago. There are enough evidence that the Juan de Fuca plate’s ocean floor underthrust beneath North American plate (Atwater, 1970). Nazca plate have been subducting under South American plate for the past 70 million years, forming Andes Mountains. Caribbean plate moves due west with respect to South American plate at a rate of 20mm/year. Spreading rate in the southeast Pacific and South American plate is increasing. (http://americastectonics.weebly.com/south-american-plate.html). 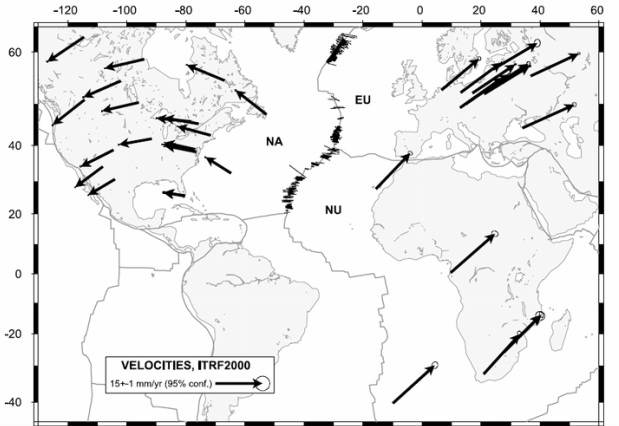 This link shows the global plate boundaries and their relative velocity. Ocean floor in red represents the newly formed plates while blue represents the older plates. Somoza R. “Updated Nazca (Farallon)---South America relative motions during the last 40 My: implications for mountain building in the central Andean region” Journal of South American Earth Sciences 11, no. 3 (1998): 211-215. Calais, E., C. DeMets, and J.0M. Nocquet. "Evidence for a post-3.16-Ma change in Nubia-Eurasia-North America plate motions?" Earth and Planetary Science Letters 216(2003): 81-92. DeMets, Charles, and Timothy H. Dixon. "New kinematic models for Pacific-North America motion from 3 Ma to present, I: Evidence for steady motion and biases in the NUVEL-1A model." GEOPHYSICAL RESEARCH LETTERS 26, no. 13 (1999): 1921-1924. Tectonics Observatory at Caltech. Accessed January 30, 2014. http://www.tectonics.caltech.edu/images/maps/seafloor_age.pdf. Americas:Tectonics. "North American Plate - Americas:Tectonics." Accessed January 30, 2014. http://americastectonics.weebly.com/north-american-plate.html. Dokka, Roy K., and Christopher J. Travis. "ROLE OF THE EASTERN CALIFORNIA SHEAR ZONE IN ACCOMMODATING PACIFIC-NORTH AMERICA PLATE MOTION." GEOPHYSICAL RESEARCH LETTERS 17, no. 9 (1990): 1323-1326. Atwater, Tanya. "Implication of Plate Tectonics for the Cenozoic Tectonic Evolution of Western North America. "Geological Society of America Bulletin 81, no. 12 (1970): 3513-3536. Americas:Tectonics. "SouthAmerican Plate - Americas:Tectonics." Accessed January 30, 2014. http://americastectonics.weebly.com/south-american-plate.html.